The peregrine falcon is returning to densely-populated parts of Connecticut. 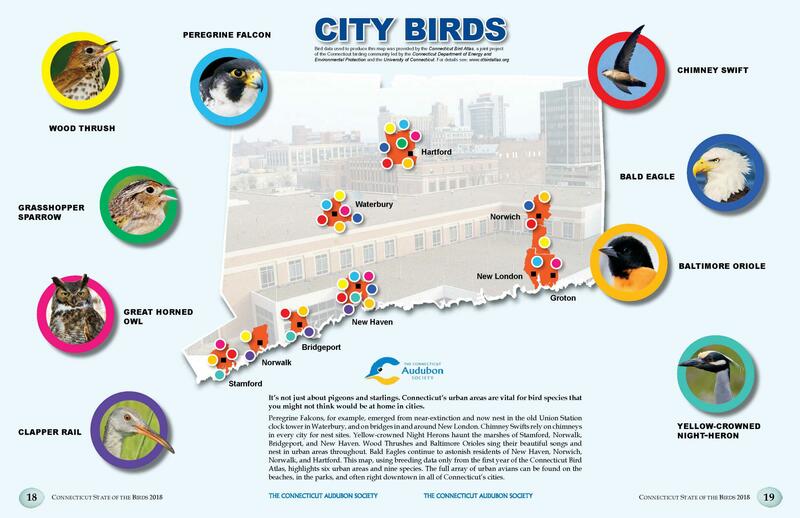 Whether you live, work, or play in a city, increasingly, you’re likely to see some really cool birds. “For example, peregrine falcon used to be wiped out from this area. And it used to be a huge deal to see a peregrine falcon,” said Patrick Comins, executive director for the Connecticut Audubon Society. Comins’ group just issued its annual “State of the Birds” report. Bald eagles are returning to Connecticut in record numbers. And ospreys, once almost eliminated from Connecticut, have returned to cities and urban harbors. For these trends to continue, Comins said cities and the federal government need to step up. His organization’s report urges Congress pass the Recovering America’s Wildlife Act, a $1.3 billion proposal, which has languished over the years. An excerpt from the 2018 State of the Birds Report. If approved, it would inject millions into state wildlife efforts through fees that are already collected from energy suppliers drilling in federal waters. In 2016, Connecticut received around $482,000 from the federal government for implementation of its state wildlife plan, according to the Department of Energy and Environmental Protection. If the Act were passed, the state would receive more than $12 million annually. “It would be a total game changer,” Comins said.